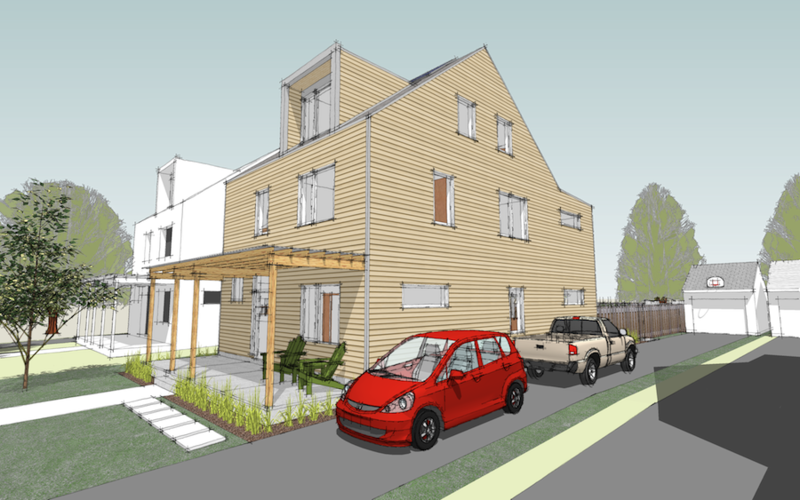 Building on the lessons learned from our study of the Swedish housing industry the XHouse4 achieves high energy efficiency while using construction methods that are available right now. This is a high performance house that we can build TODAY. It includes the option for a highly insulated slab on grade foundation that follows systems in use in Sweden. We endorse this insulated slab system as a way to transfer construction value away from putting concrete in a muddy hole in the ground, but rather into a highly energy efficient foundation. 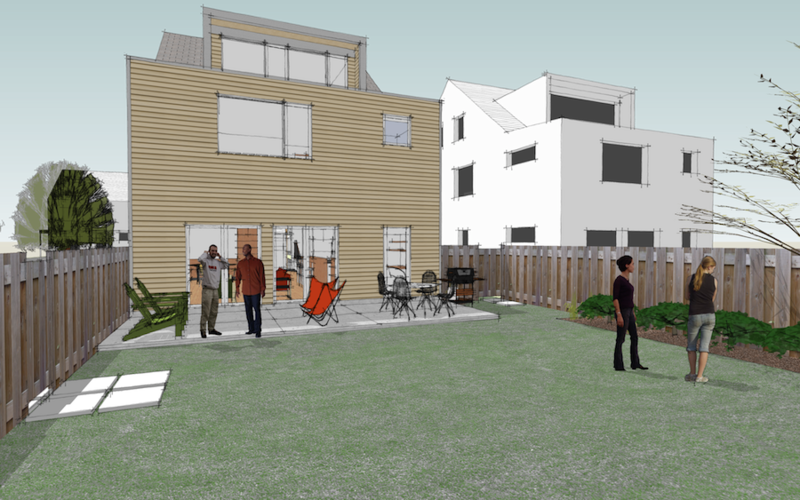 The XHouse4 uses a variation on wall construction typical in Sweden, adapted to standard US products. We call this wall the USA New Wall. Construction Prints offer plans in 2x6 wall depth, however it is easily expanded to 2x8 based walls for the coldest regions. These wall designs provide for a high R-Value insulation batt, and additional exterior & interior insulation layers that break thermal bridges through the wall. These walls are built with a variation on the typical framing configuration which we call the Swedish Platform Frame. This framing method also reduces thermal bridges through the wall increasing efficiency, and lends itself to panelized off-site construction. The XHouse4 is not a house of the future, or an idea waiting for technology to catch up. It is a high performance home for TODAY. The XHouse4 brings together all of the breakthroughs of our house plan collection. 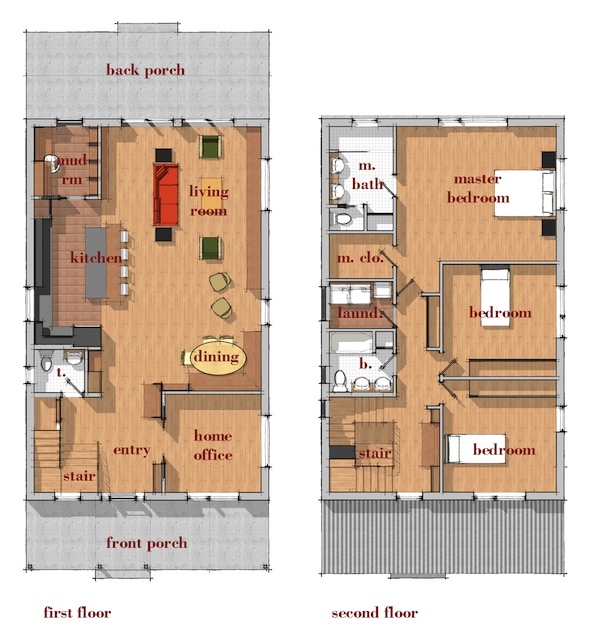 The XHouse4 delivers a smart floor plan, making the most use of a modest amount of square feet. 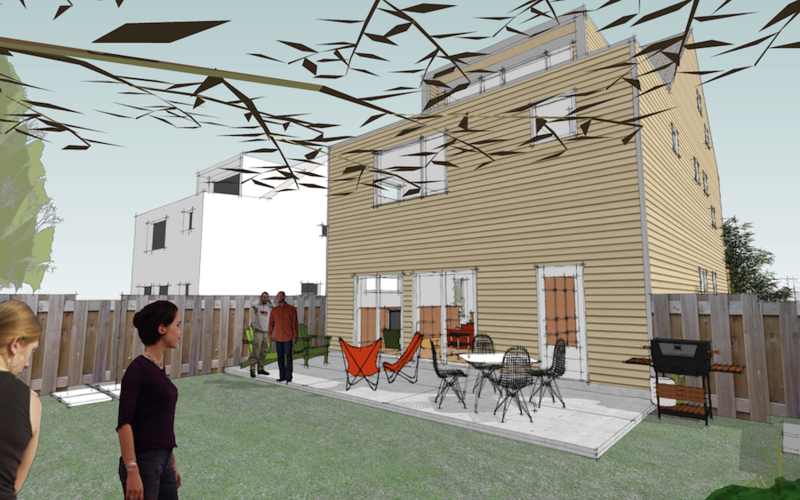 The house is configured to fit into the development pattern of old neighborhoods making it an ideal infill design. And its MoTrad aesthetic allows it to live comfortably with traditional neighbors while still delivering the modern house you won't find offered in the housing market. And lastly the house incorporates our state of the art design for energy efficient construction. Lets look briefly at each of these points. 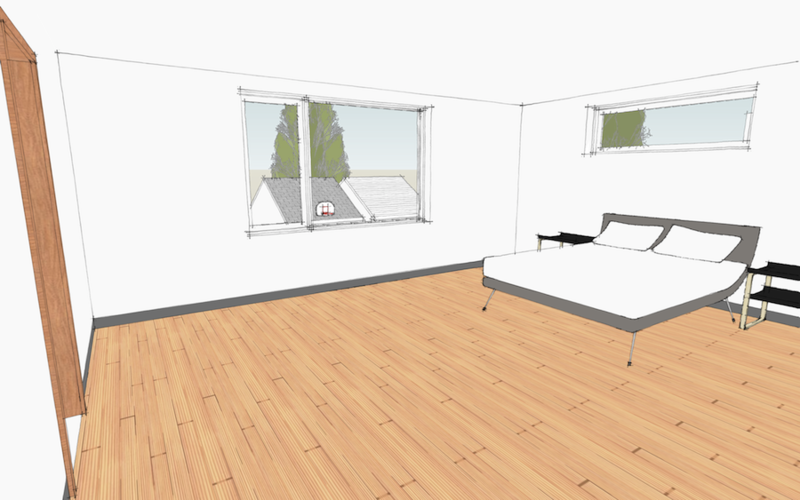 XHouse4 is a 3 bedroom design with generous sized rooms, and a comfortable master suite. 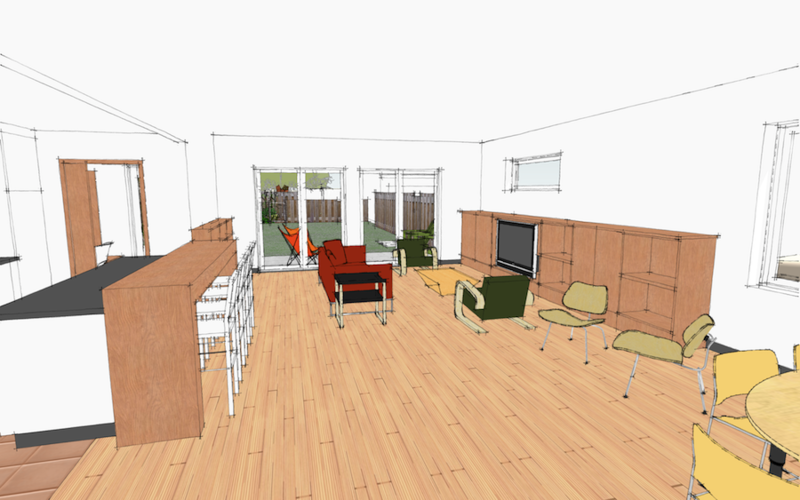 The ground floor is dominated by a large open plan living/dining/kitchen space. The plan is flexible and allows multiple possibilities for organizing your living patterns within it. The ground floor is supplemented by a discreet home office space which could also serve as a guest room or other separate function. There is also a small mudroom entry at the rear of the house that allows you to buffer the clutter of coming and going from the living space. 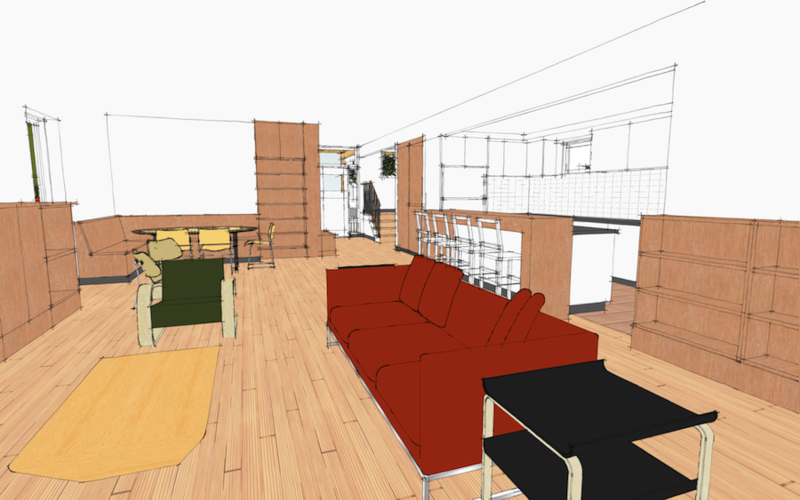 The house design includes a large attic level which can be finished into an additional bedroom or common space. 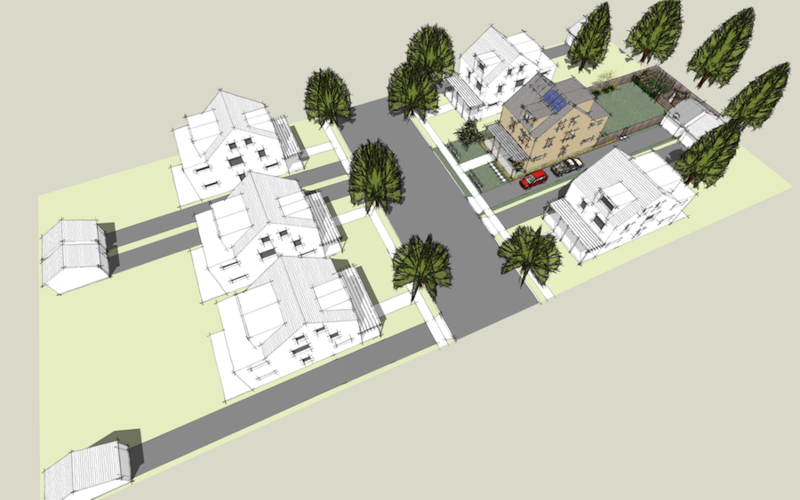 The form of the house follows the narrow and deep pattern of houses in older neighborhoods. As such the house fits perfectly into infill sites, or into new developments following traditional neighborhood development patterns. A front porch overlooks the street and provides that wonderful halfway in, halfway out space. A rear porch or deck interfaces with the backyard, and provides an entry point when coming from the driveway, or garage at the back of the lot. 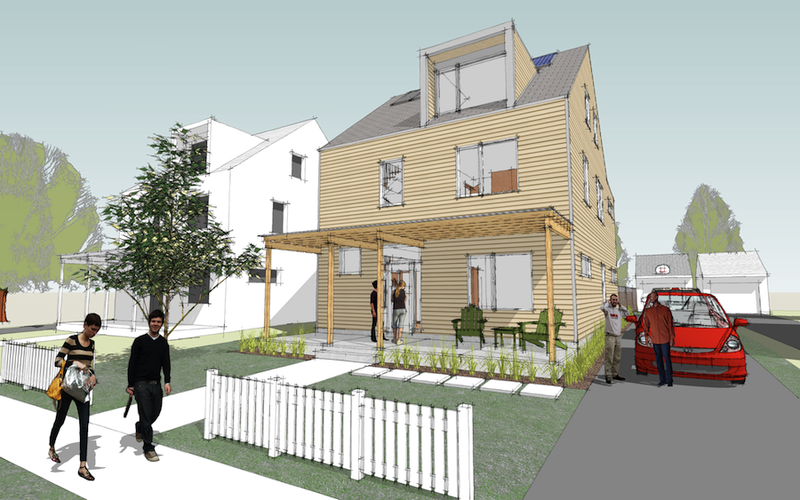 The house will work equally well on lots with rear alleys, or those without. The 24ft width of the design allows it to fit on narrow lots. XHouse4's MoTrad aesthetic is a fusion of Traditional massing and forms, and Modern detail and aesthetic. So for instance the profile of the XHouse4 has a peaked roof, and a front porch - consistent with many traditional house forms. But the house has a minimalist surface and modern detail on its architectural elements such as the roof dormers and front porch. We have seen a lot of this MoTrad aesthetic in Europe and think its time has come here in the US. If the XHouse4 is a little too wide for your lot, then take a look at its slightly narrower cousin the XHouse5. 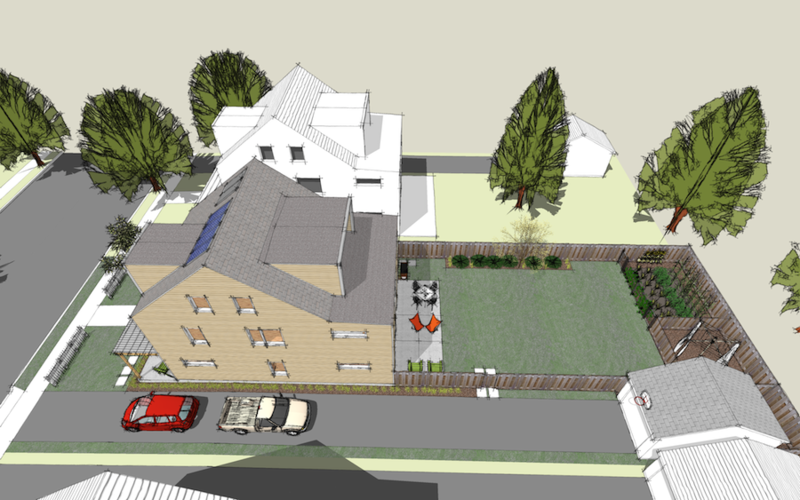 Read on about the XHouse4's energy efficient construction below the images. Have a question about this design? Ask us. By purchasing Prints online you are agreeing to the terms of our License Agreement. Facts: Two & one half story, wood framed dwelling on a basement or insulated slab on grade foundation, with a sloped shingle roof system, low slope roofing at the rear roof and dormers, and a corrugated metal roof at the front porch. First floor spaces include entry foyer, half bath, home office, open plan living room, dining room, and kitchen, and a mudroom rear entry. 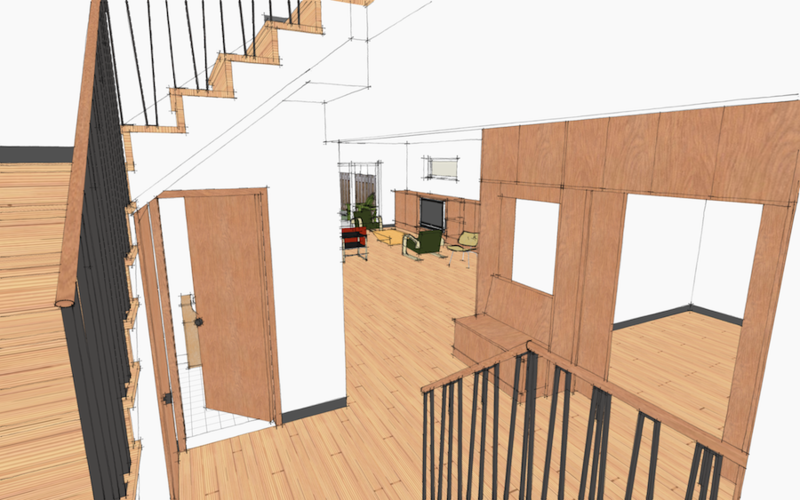 Second floor spaces include two bedrooms, hall bathroom and laundry room, and master bedroom suite. An attic level may be finished into an additional bedroom with bathroom, or a large common room. 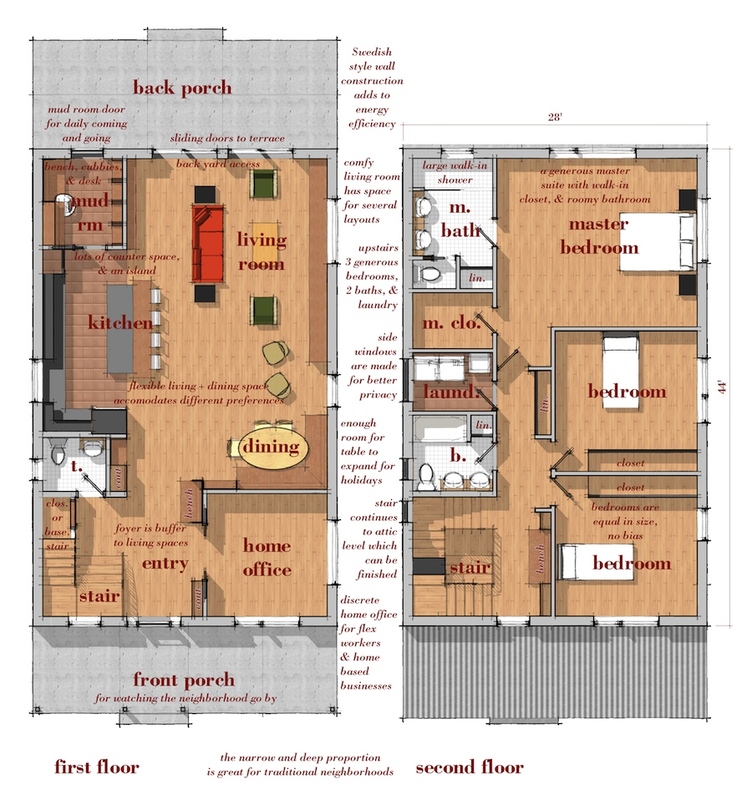 Square footage: calculations are for primary conditioned living space and do not include attic or basement levels, porches, terraces, or other outdoor space.